Susan Moser received her dance education from the Ohio State University Department of Dance, with a focus on Composition and Performance. Post college, she was a principal dancer with the Valois Company of Dance, Detroit MI and Toledo, OH. Her modern dance training continued with the Liz Lerman Dance Exchange, Senta Driver, Buzz Miller, Ruth Solomon, Shawn Womack, Cheryl Wallace and the famed Lyndon Branaugh (with the Graham Institute in London). Further training included studying Kinesiology and Movement for Stage Actors with Barbara Leverone and Movement Therapy with Fanchon Shur. Moser composes and performs her original works for the Contemporary Dance Theater, Cincinnati Aronoff Center, Cincinnati School for Creative and Performing Arts, Cincinnati Fringe Festival, Hamilton Fairfield Symphony Orchestra and Creativa: A Convergence of Creative Visions. She is the Founder, Owner and Artistic Director of Tänze Performing Arts Studio - a performing arts school located in Fairfield OH., serving the community with multi-cultural and multi-generational programs in dance, theater, music and visual art. Moser is deeply involved in the movement of arts in education, and has been a resident artist for Fairfield City Schools, Schilling School for Gifted Children and the Learning Tree. She has written curriculum for K-3 Arts Integration in Education for Spectra+, introducing how dance, drama and music can be used in daily lessons of math, social studies and language arts, and taught Creative Movement and Dance Composition for grades K-12 for Schilling School for Gifted Children. Moser is summer faculty at the Contemporary Dance Theater, The Cincinnati Arts Museum Summer Camps and Leadership Cincinnati Explore the Arts Day. Fitness Education has been a vital part of her artistic process. She was the anchor of Rock Aerobics on WOIT FM 104 in Toledo OH, and she had the opportunity to be a guest fitness trainer for the Detroit Lions in conjunction with Vic Tanny International. Moser holds licenses and certifications through International Health and Fitness Education, with a focus on Special Populations, American Exercise Safety Association, Dance Educators of America and Educational Kinesiology through The Ohio State University. 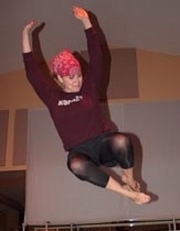 She is also a former Resident Dance Artist with the Ohio Arts Council-Arts in Education Program. Professional affiliations and awards include: International Thespian Society, Alpha Xi Delta Fraternity, Psi Chapter, National Dance Association, Ohio Dance Association, Golden Apple Award-Fairfield City Schools, Fairfield, OH, 4C Childcare Recognition Award and President’s Community Service Award of the Hamilton Fairfield Chapter of the NAACP. Though dance is her passion, Moser enjoys sharing her gifts and talents with the world of theater. She has been a Movement Specialist for Miami (OH) University Theater Department, Mad Anthony Theater Company, Hamilton Fairfield Civic Theater and CCM Drama and Opera Departments. Bachelor&apos;s, The Ohio State University, Columbus, OH. 2006 to To Present, University of Cincinnati College-Conservatory of Music.